The GIS mapping of trails has allowed the Parks and Recreation Department to complete the package needed for Planning Commission review/approval. Cities with explosive growth need to optimize their resources. This is a truism regardless of their size, shape, or location. Case in point: Based on preliminary Census 2000 data, Moreno Valley in Riverside County is the sixth fastest growing city in California and 26th in the nation. Once an infant among California cities, Moreno Valley, situated 70 miles east of Los Angeles, now has 150,000 residentsa 450 percent increase over its 1980 population of 28,000. Like many other cities across the United States, Moreno Valley first acquired GIS to help manage its growth. The city began its GIS journey with desktop mapping software that was used by various departments. For the most part, the software was used for mapping, visualization, and query, with its users working independently. The city eventually realized it needed a more strategic plan to deploy its GIS and turned to its newly hired GIS coordinator Michael Heslin for help. Heslin conducted interviews with various city agencies and performed an extensive GIS needs assessment. He also investigated how other local government agencies managed information; in the process he studied other enterprise implementations and instantly recognized the many benefits that were possible. 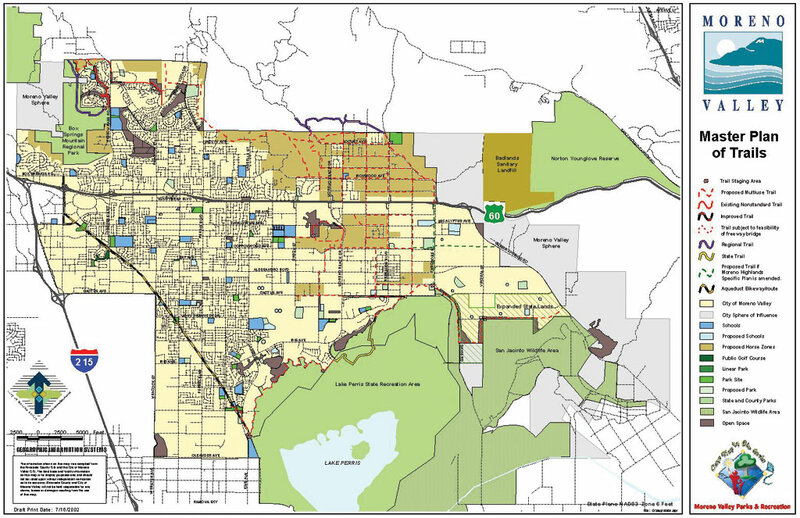 What resulted was a clear understanding that an enterprise GIS implementation was needed to streamline Moreno Valley's GIS processes and leverage the true analysis capabilities a GIS would provide. In addition, Heslin recognized the need for leveraging data managed independently within separate departments. An enterprise approach would allow various departments to use data managed outside their own department. Plus, the city wanted more powerful functionality. Using his prior knowledge and experience, bolstered with the information resulting from the interviews and investigation, and taking into consideration the city had 32 seats of ArcView, Heslin made his decision. He realized that migrating to ArcInfo would add advanced geoprocessing and data conversion capabilities including tools for data creation, update, query, mapping, and analysis. In addition, ArcIMS could provide an intuitive, Web-based platform for sharing data and applications easily throughout the city. Thus, in 2001, the city selected and successfully made the move to ArcGIS software and then had a true enterprise GIS in place. The city uses ArcInfo 8.3, ArcView 8.3, ArcView 3.2, and ArcIMS 4.0.1 and is now deploying GIS for virtually all city departments including planning, public works, fire, law enforcement, parks and recreation, and economic development. Today, the city is doing more with fewer resources and doing it in less time. The city quickly began capturing data and performing a wide range of GIS applications. In addition, several other municipal, county, and state agencies already using Esri GIS software were contacted, and information sharing began to take place. Now Moreno Valley has a vast array of existing, up-to-date data sets to work with as part of its own GIS work. "Prior to GIS, many of the analysis capabilities available today were simply not available," adds Heslin. "By moving to an enterprise GIS, you can better share and distribute information. And you have the whole analysis capability. It has real, lasting value in numerous ways. "City staff had used the databases in the past to store their departmental information," continues Heslin. "We moved to an enterprise GIS system, meaning information is deposited in a central location and can be shared from department to department using a common data standard. Users can retrieve any available information from their desktop rather than knocking on doors or calling people to request information." 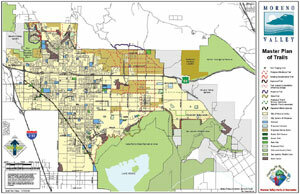 Moreno Valley's GIS includes the ability to look up a property by the assessor parcel number, address, or property owner as well as generate notification mailings, view buffer maps, and print full property records. An important GIS application involved an impact study for a proposed hiking trail project. The city needed to decide whether the proposed multiuse trails project was a worthy endeavor. The GIS Department collected data from different sources including paper maps, on-the-fly digitizing of aerial photos, GPS mapping, input from a trails committee, and other public sources. GIS analysis was performed by evaluating a number of different variables including impact on funding, integration into existing trails, and more. Trails were mapped using aerial images, some were mapped in the field, and some were already stored in digital format and input into ArcGIS. "Once the data was in GIS, then calculations became a snap," says Heslin. "We could calculate linear feet for any type of trail, calculate how much a trail would cost, determine which properties it would cross, and more. 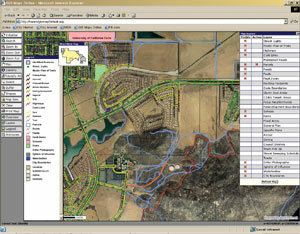 It essentially saved several hundred hours of manually mapping trails and performing analysis." Collaborative efforts were made with other municipalities. The cities of Riverside and Corona, both also within Riverside County, got together with Moreno Valley and shared land use, planning, zoning, parks, and other information for a California Department of Transportation (Caltrans) project to get a better understanding of trails and their interconnection between these cities. "We've learned a lot from other government agencies, both larger and smaller than we are, that have done similar things and have important lessons to share," says Heslin. "There's a great user community out there to learn from, and Moreno Valley is certainly taking advantage of this simple fact." The GIS Department shares its database with the Fire Department so it can have a better understanding of roads, access ways, and other data crucial in an emergency response and for emergency mitigation planning. "There's a huge benefit for how decisions are being made because there's more accurate, detailed information available to more people," says Heslin. "Our enterprise GIS provides a jump-start to City Hall and other professionals who need to do a vast array of diverse research. It also helps us work with other cities in joint projects." Users accessing the database have a large number of tools for performing queries and analysis. For instance, a search can be performed by street location, ZIP Code, parcel number, zone identification, or any number of spatial and asset identifiers. The automated links between spatial and tabular data provide a sophisticated integration method for greater analysis. "Government employees can look at a map and drill down to view related map data or look at a database record and then access a map," adds Heslin. "People may not even know exactly what they're looking for but, geographically, they know it's around a general area. They can then drill down and pull up other layers of information. They couldn't do this before. If they're researching a project in the city, they may want to see what impact it will have on school systems, parks, traffic, or other entities. They can make better decisions and, ultimately, save money by making sure budget dollars are spent in the best manner possible." The city also recently finalized the development of an ArcIMS software-based Intranet site. "With an Intranet-based interface to our information, we can serve a greater number of government employees more efficiently," concludes Heslin. Future applications include integrating GIS with Moreno Valley's permitting system. The city is also in the process of developing an economic development Internet site. For more information, contact Michael Heslin, GIS coordinator, city of Moreno Valley (tel. : 909-413-3418; e-mail: mikeh@moval.org).